The V-shape Expert Bio-essence has recently launched the newly improved Bio-essence Extra Strength Face Lifting Cream with Royal Jelly & ATP. To have a greater effect of facial contour, Bio-essence also introduced 2 new extensions to its well-received Deep Exfoliating Gel to cater women & men of different skin types. Deep Exfoliating Gel (Oil Control) and Deep Exfoliating Gel (Sensitive Skin) both contains Royal Jelly and ATP. I tried both Bio-essence Extra Strength Face Lifting Cream & Deep Exfoliating Gel (Sensitive Skin) for a week and it has shown effective results, read on for the before and after pictures. An unique combination that has proven its efficacy in recreating youthful, bouncy skin. Royal Jelly contains proteins and 17 types of amino acids to encourage natural cell renewal and generation along with vitamins and an abundance of minerals. Skin is deeply nourished to attain a natural radiance. Adenosine Triphonsphate which known as ATP is responsible for provision of energy to our cells all over the body. The new ingredient Bio Face-Lift, enriched with skin nourishing powerhouse Bio Rice Fermentation Essence to give extra V and extra lift, as they drench all layers of the skin with moisture and boost skin’s firmness for an even more defined V-shape. Reviews: Although its a cream type of moisturiser but its non-greasy. I have a combination skin and usually not encourage to use cream moisturiser but Bio-essence Extra Strength Face Lifting Cream works great on my skin without any breakouts. I love the minty and cooling sensation after application. I will massage my lower chin area with lifting movement until the cream being absorbed into my skin, it took around 10 seconds. 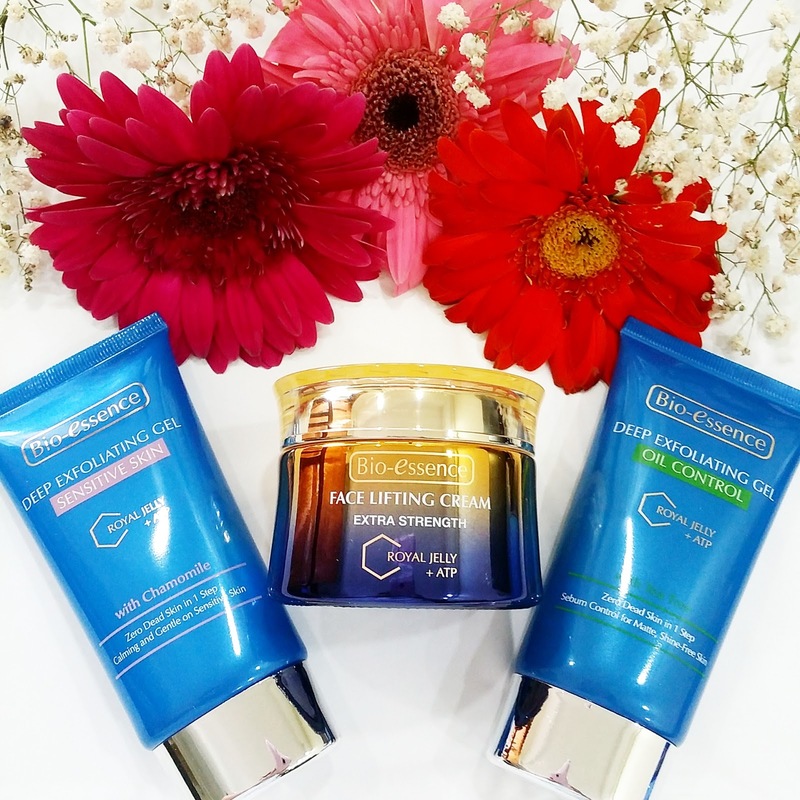 To enhance the V-shape facial contour effect, Deep Exfoliating Gel (Sensitive Skin / Oil Control) is encourage to use together with Bio-essence Extra Strength Face Lifting Cream. Previously, Bio-essence only have 1 Deep Exfoliating Gel for all users, but now Bio-essence has launched not just 1 but 2 newly formulated Deep Exfoliating Gel (Sensitive Skin) & Deep Exfoliating Gel (Oil Control) to cater Sensitive skin and Oily skin types of users. It’s a high-tolerance formulation which gently rubs away dead skin without any irritation. Enriched with German Chamomile, this formula calms and soothes sensitive skin during exfoliation. Skin instantly smooth, fair and healthy. Reviews: I uses Deep Exfoliating Gel (Sensitive Skin) about twice a week. It’s gentle to my skin, not like the normal scrub in the market with beads, Bio-essence Deep Exfoliating Gel its safe for your skin and create no irritation. Make sure your skin and hands are fully dry when using it, massage in circulation motion around your face, you can feel and see the flakes of dirt and dead skin. Remember after rinsing off, do follow up with a cleanser to cleanse off all the dirts. Gentle anti acne formula enriched with natural Tea Tree Leaf and Tea Tree Essential Oil which works effectively on oily prone skin. Blackheads are thoroughly exfoliated and skin get deeply cleared from oil impurities. Skin feels matte and blemish free. I would recommend Deep Exfoliating Gel (Oil Control) to the younger generation or people who have oily and acne skin types. As you all know, Tea Tree is the best ingredients to calm acne prone skin, anti-bacterial and anti-inflammatory. I tried it on my hand and I love the Tea Tree scent. Highly effective for clearing blemishes and reduce breakouts without drying skin. Here’s the before and after pictures of my face. 1 week of using of Bio-essence Extra Strength Face Lifting Cream & & Deep Exfoliating Gel (Sensitive Skin). I could see a difference in my face shape. My cheeks has became firmer and bouncier, face shape has lifted up and more define. I will definitely continue using to achieve a more V-shape facial contour. Bio-essence Extra Strength Face Lifting Cream & & Deep Exfoliating Gel (Sensitive Skin / Oil Control) are now available at all Watsons Stores. Thanks Bio-Essence and Touch PR & Events for the awesome products.